NMM 4168. Upright piano by Decker Brothers, New York, ca. 1895. Serial number 25089. Paul von Jankó experimental 6-6 keyboard with 264 keys. Serial no. 25089. AAA-c5 (7+ octaves). Two pedals: half blow, dampers. Decker Brothers introduced Jankó keyboards into their pianos in 1891. Gift of Mrs. Merritt A. Williamson, Nashville, Tennessee, 1987, in memory of her husband. The modern science of ergonomics developed out of the military need to improve the safety of equipment during and after World War II. The word, ergonomics, was coined in 1949 by K. F. H. Murrell, a pioneering British researcher in the field. Although many musical instrument makers have attempted to "reform" traditional instruments during the last three centuries, most of the changes were intended to alter or improve the sound or to introduce novel construction materials, rather than to make musical instruments less strenuous to play. One early exception was an invention by Paul von Jankó, a Hungarian mathematician, engineer, and musician, who developed a piano keyboard in 1882 that reduced the hand stretches required of the player, making it easier to play in all keys. 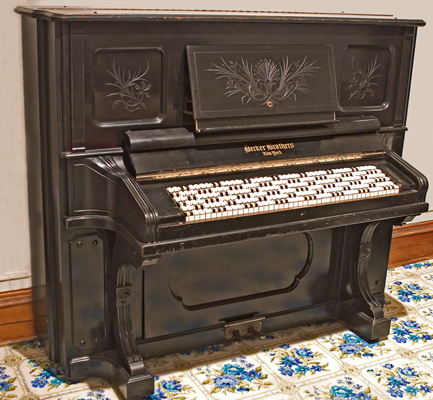 The keyboard was also stepped down toward the player, as is the modern computer keyboard, to produce "less exertion than ordinary pianos." As stated in Jankó's 1887 U.S. patent, "The strong muscles of the arm are utilized to the best advantage . . . in an easy and convenient position." However, the design failed to gain acceptance, pianists being hesitant to learn a new system. A Jankó piano, built by the Decker Brothers in New York about 1895, can be seen at the NMM in the Lewison Gallery. Literature: Musical Six-Six Newsletter, Vol. 12, No. 2, Issue 32 (1983), p. 1. "Important Acquisitions Made by Museum in 1987," Shrine to Music Museum Newsletter, Vol. XV, No. 2 (January 1988), p. 2. "Rare Piano Received," Shrine to Music Museum Newsletter, Vol. XV, No. 3 (April 1988), p. 4. André P. Larson, The National Music Museum: A Pictorial Souvenir (Vermillion: National Music Museum, 1988), pp. 56 and 63. Arian Sheets, "If Salvador Dali Played the Viola . . . Art Meets Ergonomics in a Distinctive New Instrument," National Music Museum Newsletter 32, No. 4 (November 2005), pp. 4-5.